You can buy Hyalase from us. Our helpful customer service representatives will be glad to assist you in placing your orders. Submit your oder by fax, email, or order online from our website anytime. Hyalase is a powder form of the enzyme hyaluronidase, and is used as a dispersion agent to speed up the natural breakdown of sodium hyaluronate or hyaluronic acid (HA). If you’re a licensed medical practitioner that prescribes dermal fillers, it is essential for you to keep a supply of Hyalase. 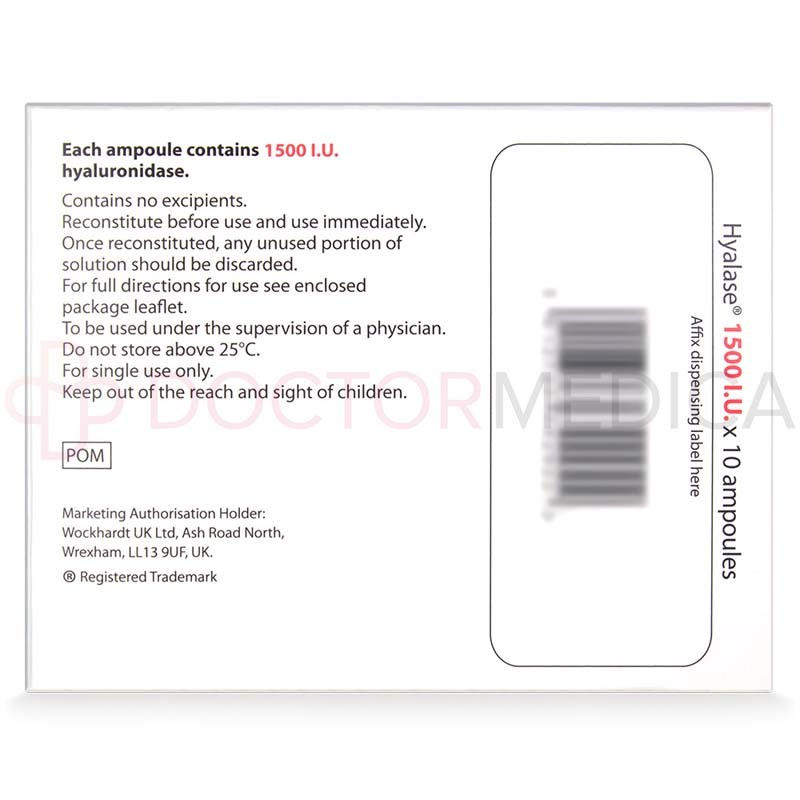 Hyaluronidase is a natural enzyme that will help you manage your patients’ condition, should overcorrection occur. 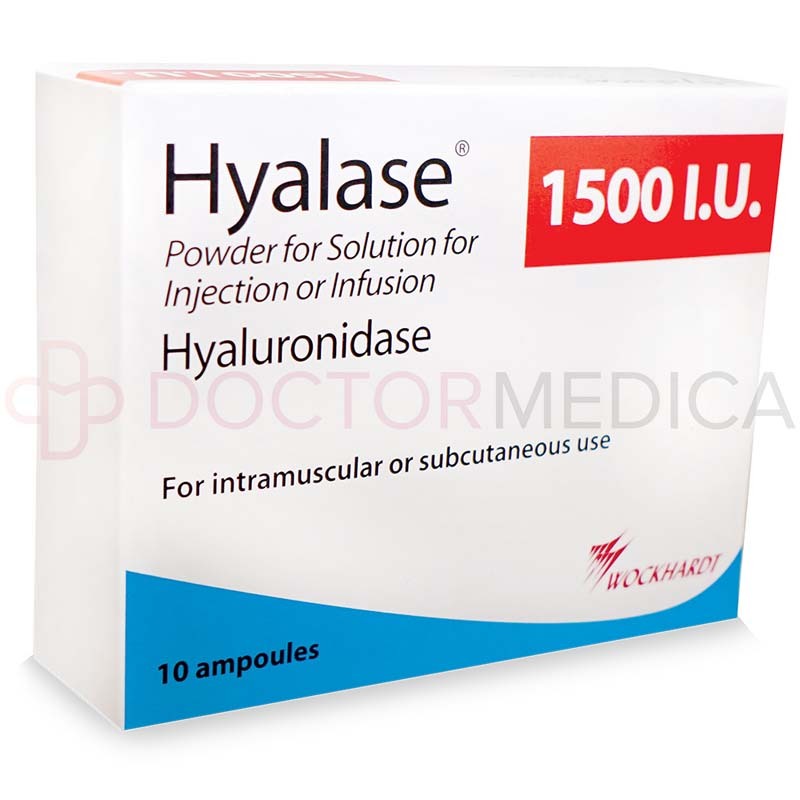 A package of Hyalase contains 10-1ml ampoule containing 1500 units of hyaluronidase in powder form. This white, sterile powder should be dissolved in water, normal saline, or the solution that will be injected. 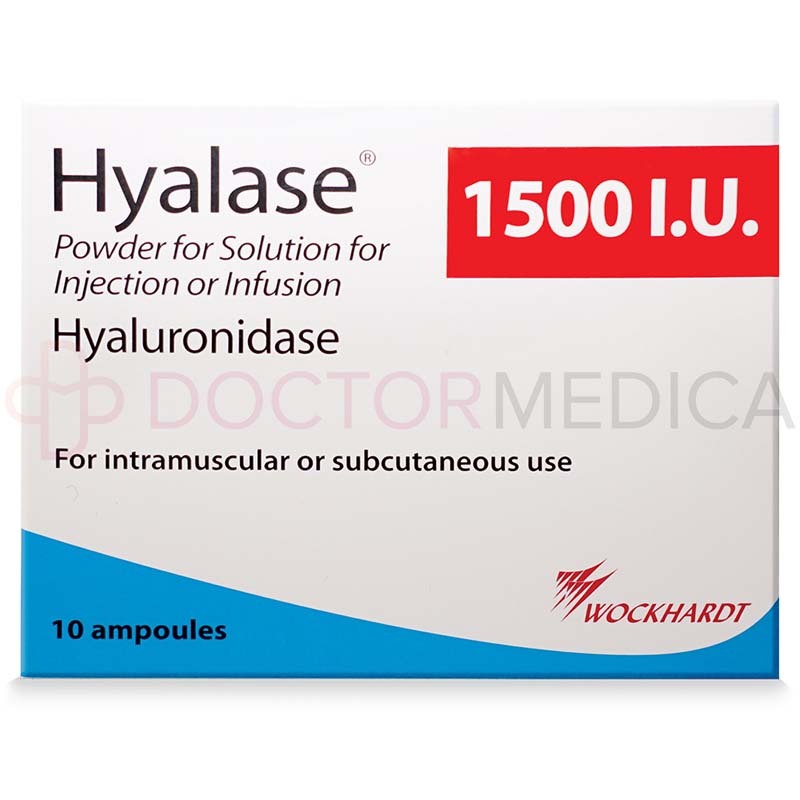 Hyalase is an essential part of all aesthetic clinics and hospitals that frequently administer hyaluronic acid-based dermal fillers. It is widely used to disintegrate hyaluronic acid gels injected into the dermis. This reverses unwanted results from dermal implants with less risk of hypersensitivity. It also manages various complications that result from erroneous application of HA cosmetic fillers. 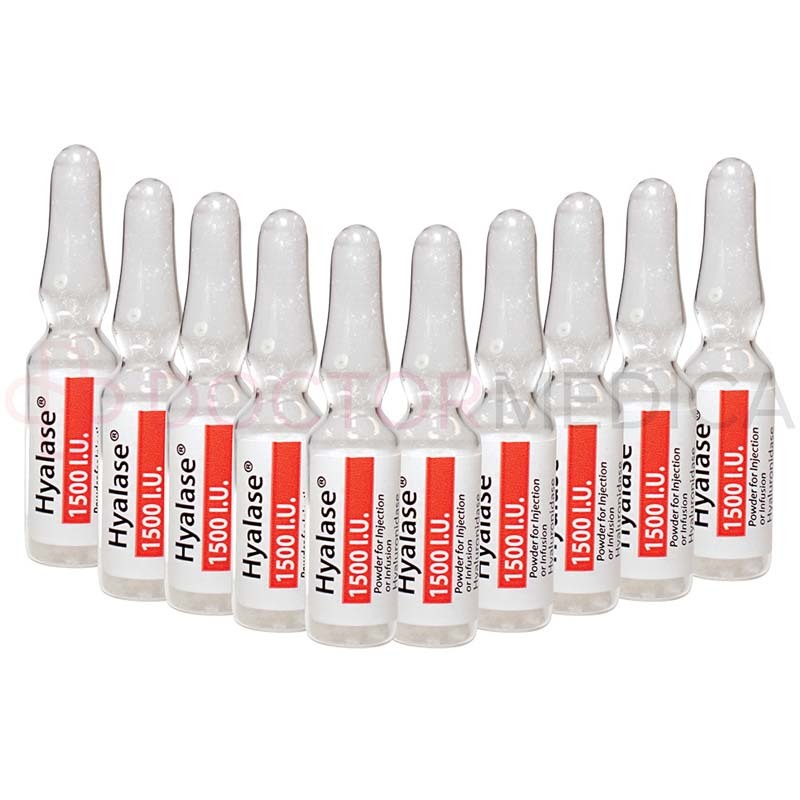 A Hyalase ampoule contains 1500 international units of hyaluronidase and sodium hydroxide. The enzyme hyaluronidase has a temporary and reversible depolymerizing effect on hyaluronic acid. It renders the substance more permeable, permitting rapid breakdown and absorption of the injected gel. Hyalase contains a purified and standardized preparation of the enzyme hyaluronidase in powder form. It reverses the effect of hyaluronic acid fillers by increasing the breakdown of HA. As traces of HA are absorbed in the body, the integrity and previous shape of the tissues are recovered. Prior to administration, dissolve the powder in 1ml of sterile distilled water or directly into the prepared solution you want to give in combination. Use immediately after preparation, as the enzyme loses its effectivity in 12–24 hours. It is important for the administration to be extremely accurate and the solution must be limited to the affected area. 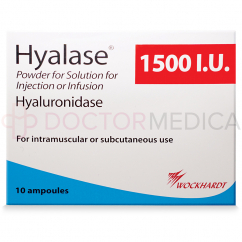 Each ampoule of Hyalase is for single-use only; discard any remaining contents of the vial. Please refer to the product leaflet for a complete list of indications and instructions for proper administration. The duration of treatment depends on the administration process and the amount of enzyme required to treat the condition—you can give Hyalase via injection or subcutaneous infusion. Via hypodermoclysis, 200ml of fluid can be administered within 20 minutes. Doctors, dermatologists, and other licensed medical professionals use Hyalase to correct unwanted results from HA dermal filler injections. You may also consider using it to manage conditions that cause a build up of excess fluids and blood in the tissues. Do not use hyaluronidase if infection is suspected; antibiotics should be given instead. Hyalase can be used to treat different regions of the face, neck, and hands. In most cases, results are seen immediately. Schedule an appointment at least 2 to 3 weeks after the treatment to review your patient’s condition. Though dermal fillers are generally safe and effective, poor injection technique and lack of experience by the attending clinician are just few of the factors that may cause overcorrection and serious complications. It is extremely important to have proper knowledge of anatomy, physiology, and the chemical properties of the product being administered to avoid risking your patient’s well-being. Hyalase is trusted by doctors because of its efficacy and safety, and as a reliable agent in emergency situations. Doing a patch test decreases the risk of allergic reactions, but some doctors believe that it’s justifiable to administer Hyalase immediately. Observe the patient for approximately 30 minutes after the treatment, and watch for signs of erythema, inflammation, and itching. Refer to the product documentation for the complete list of side effects, precautions, and contraindications.